What Rug is Right For Me? Let’s think about the room(s) or area(s) in your home. Are you looking to completely cover your floor? Then you are looking for wall to wall carpeting which we refer to as ‘broad loom’. If you are looking for an area rug, what size? Take a tape measure and decide the approximate width and length you would like. Also, measure the dimensions of the entire room or area and take pictures on your phone from several angles. These steps will assist your rug dealer to offer you complementary product ideas and sound size selections. How much foot traffic does the area get? How much vacuuming is too much vacuuming? It may sound silly, but if that is the most dreaded chore on your list we can suggest products that will make the job easier. Does your family have any allergies? For example, it is very common for pets to be allergic to wool. What is your budget? Don’t be afraid to let us know. Our products are competitively priced, with our price guarantee. Knowing what you can afford will help us find the absolute best product at the absolute best price. Broadloom is any carpet woven on a wide loom that has no seams. Broadloom is usually installed from wall to wall of a room, firmly stretched and sured to the floor edges. There are maximum widths broad loom can be manufactured, 54″ width is most common. Your professional rug installer will manually ‘seam’ sections together on site. When using a quality professional, the seams will be invisible and the nap and pattern of the rug will flow perfectly. Here at Kaoud’s, we only carry the best broadloom products on the market today. From soft solid tones to bold prints and everything in-between, our broadloom choices are virtually endless. What Are the Best Rugs for Pets & Busy Families? Karastan, one of the premium leaders in rug manufacturing, introduced their SmartStrand Forever Clean® product line. Using the most advanced fiber innovation, SmartStrand offers the highest level of beauty, comfort and absolutely remarkable performance. With incredible long-lasting durability, this line is incredibly easy to clean. We just have to show you! The SmartStrand Forever Clean® rugs would be my #1 choice. What is a Power Loomed Rug? For those that are looking for all the beauty of an oriental rug but don’t want the price tag (or wish to stay away from mostly wool products), a power loomed rug may be the perfect choice. Power loomed rugs are also much more fashion forward, offering an abundance of design from traditional patterns all the way to ultra contemporary. The manufacturers of the machine made oriental carpets have successfully combined the science of machine carpet weaving processes and the art of creating beautiful designs. These designs often mimic the fine hand-knotted carpets as a more economical alternative. 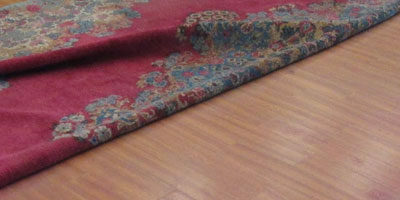 Machine made carpets can be constructed from various materials with wool and polypropylene being the most common fibers. Kaoud selects only the finest U.S. and European carpets to be carried in our stores. We stock thousands of carpets from 2×3 to 12×18 and any custom size in between. With our large selection, you will find the “perfect” oriental rug to be the focal point in your room, as well as easily coordinating colors and styles for any other room or staircase you may have. What Does Hand Knotted Mean? Hand knotting is a special characteristic of the oriental rug. It’s what gives a rug beauty and character. Hand knotted rugs have been produced for over 150 years, some of which are still in existence today. Hand knotting gives the character and detail of all the intricate designs that have been passed down from generation to generation. The materials used in hand made rugs, primarily being wool, allow the rug to portray a depth of color that cannot be duplicated in any other way. 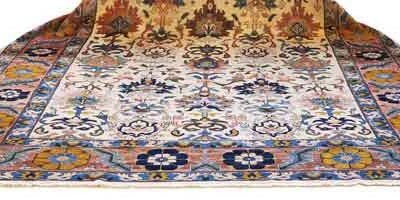 Along with the hand knotting, this depth is what makes a hand knotted rug stand alone compared to other materials. 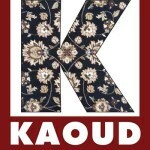 The Kaoud Family has many years of experience and expert knowledge of this technique and other weaving processes. We also have extensive experience working with the major weaving centers and crafts people around the world. Kaoud selects and imports only the highest quality goods and we inspect every rug, front and back. We know the ins and outs of weaving, handling, restoring, and how to judge the quality of oriental carpeting. That’s our commitment to our customers, as well as to ourselves. We focus on many factors, such as wool quality, when buying rugs. We urge you to compare and do the same. The wool quality will determine the overall look and color of the rug, and quite frankly, if it’s not up to par, we simply won’t buy it, nor should you. What Are Hand Tufted Rugs? Hand tufted rugs are somewhat of a “hybrid” rug in the sense that a person actually holds a needle machine that is used to punch a tuft of wool into a canvas backing. These tufts are actually held by latex rubber which is also covered by another linen covering. If the rug has a canvas backing, it’s tufted. Although tufted rugs are not as well constructed as hand knotted rugs, they are much quicker to produce and the same color and design can come in a variety of sizes. Rugs are pieces of art. Thoughts on the primal instincts, natural themes and environmental influences surround antique oriental rugs. For the discriminating oriental rug consumer, there is no better connoisseur than Rumzi Kaoud himself. Kaoud Rugs, Guilford, Connecticut offers a selection of antique rugs for discerning patrons seeking aesthetic, heritable and human value of ages-old oriental rugs. We have a wide selection of prized pieces, available online and on premise, along with restoration and appraisal services. Rumzi Kaoud started in this business over 60 years ago, along with his brothers, Fred and Abe. From humble beginnings and a profound interest in these pieces of art and their creators, Rumzi has become a renowned expert in antique oriental rugs whose opinion is widely sought for authentication and appraisals. At Kaoud’s we pride ourselves at cleaning and restoring your rugs. We have been doing it since 1954 and our experience speaks for itself when you open your newly cleaned rug. The colors are brighter. The fringes are whiter. The room become alive and fresh. It’s not easy cleaning a rug, especially the way we do. A rug retailer may know what the rug is made of and certainly should be able to calculate how many square feet you need for a room. However, a rug professional knows everything about that rug and its place in your home. How Do You Clean Fine Oriental Rugs? For us, rug cleaning is a hands-on job. Literally. We are one of the only companies that hand-wash our customers rugs. To assure that your piece of art is properly cared for, all rug cleaning is done on the premises by well-trained oriental rug cleaning professionals. 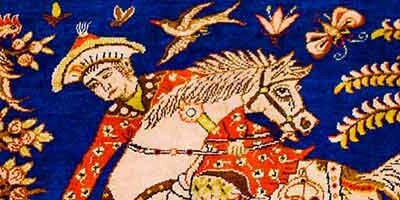 The origin of oriental carpets has been attributed to the nomadic tribes originating in Central Asia. The earliest carpet, the famous Pazryk carpet, was discovered in a Siberian burial site more than 2,500 years old.